Amboseli Camping safari, Amboseli national park, camping in Amboseli on the slopes of Mount kilimanjaro. Classic safari, Big 5 present, famous for its views of Mount Kilimanjaro, Amboseli National Reserve is at the foot of snow capped Mt. Kilimanjaro, Africa’s highest peak. 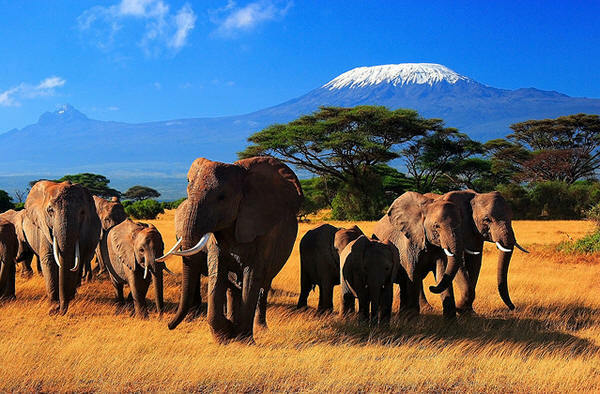 Amboseli National Park is Kenya's international biosphere reserve. Amboseli in Masai language means "place of water". Depart Nairobi in the morning and drive to Amboseli National Park arriving Amboseli in time for lunch. You will have an afternoon game drive in the park, a park famous for its big game and great scenic beauty whose entire landscape is dominated by Mt Kilimanjaro. Dinner and overnight will be at Amboseli camp. Amboseli National Park which is Kenya's international biosphere reserve. Amboseli in Masai language means "place of water". The park has an endless supply of water which is filtered through thousands of meters of volcanic rock from mount Kilimanjaro. Vast herds of elephant, zebra, wildebeest, giraffe, impala, and leopards are the main attraction. Mount Kilimanjaro forms the backdrop of this game sanctuary. The elephants in Amboseli are a Marvelous sight to behold. Early morning pre-breakfast game drive is at 6.30am, when you have the best chance to see the majestic Mt. Kilimanjaro. Return to the lodge for a late breakfast. The rest of the morning is at your leisure. Then you will have an afternoon game drive. All meals and overnight will be at the camp. After early breakfast, proceed for morning game drive. Later you will depart to Nairobi or Arusha.